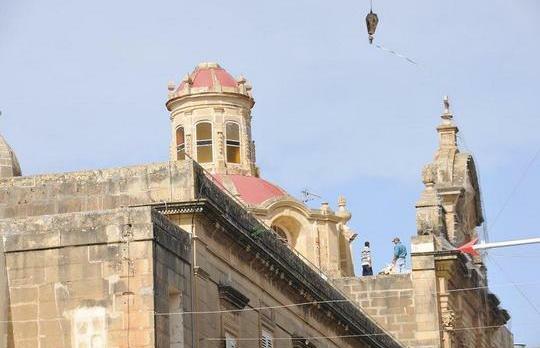 A statue of Our Lady of Pompei was toppled from the dome of a small church in Victoria last night as strong winds lashed Malta and Gozo. A number of electricity poles were also brought down, cutting the electricity supply to some areas. No one was injured. The statue stood on the dome of the church annexed to the Dominican convent at Anton Tabone Street in Victoria. The Gozo Ministry said members of the Civil Protection Department and the Department for Projects and Development had been busy clearly the streets from debris from collapsed rubble walls and uprooted trees. The ministry said that winds reached their maximum strength in Gozo at 08.09 p.m. when 47 knots, equivalent to force 9, were registered at Xewkija. The most affected areas in Gozo were Sannat, Xewkija, Nadur and Mġarr. The weather conditions on the island were expected to persist with winds varying from rather strong to strong west southwest to strong south southwest, with the possibility of reaching gale force. Calls for assistance and damage reports are being channelled through the Civil Protection Department in Gozo on 2156 4213.